My wife and I enjoy getting together with other couples to play cards once in a while. It’s a way to give the brain a workout while also having a good conversation with friends. One of the husbands, in particular, always insists on cutting the cards after shuffling them. 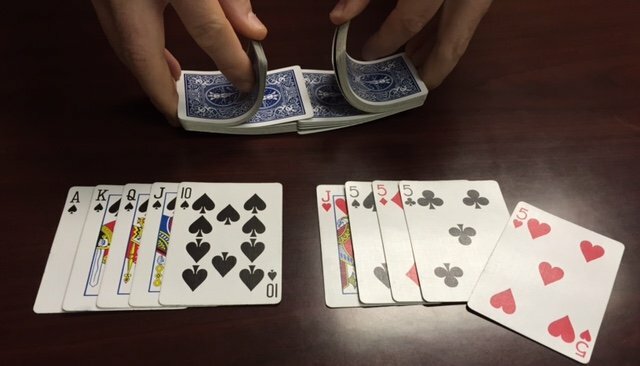 Apparently you’re less likely to be dealt two bad hands in a row if you mix them up really well. That made me think: What if the same concept were applied to the business world? The traditional marketing model is like the standard card game: Each player is dealt cards, face-down, from the top of queue (otherwise known as the deck.) Most games require that the cards remain face-down and out of their opponents’ sight throughout each round of play. Players have little or no control over the hand they receive, nor do they know what cards their opponents possess. Sounds like the traditional marketing funnel: A large number of faceless “leads” are distributed randomly to players who then arrange their hands in a way that makes sense according to the game they are playing. Just as different cards have different values or significance, different leads may require unique approaches based on their position in the buying journey. In addition, players are rarely given the opportunity to openly trade cards with one another. That’s probably where the old saying: “You need to play the hand you’re dealt” comes from. The problem with this system is that there are more losers than there need to be. Not everyone wants to play the same game and some cards have more value in one game versus another. What if this could somehow be changed? What if the cards could be dealt face-up and were matched to each specific game? Personal branding and content marketing are beginning to enable this process of shuffling and face-up re-dealing. As more and more people tell their stories online, both representatives AND customers are finding it easier to align with those of complementary beliefs and values (or separate themselves from those with conflicting world views). Such re-shuffling is likely disconcerting for “territorial” traditional representatives who see the number of products or services they have sold their customers as the definition of relationship depth, but in the end the process will prove to be quite beneficial to brands, specifically as it relates to retention. Using the analogy of the card games, some representatives prefer to play Poker while others may prefer to play Cribbage. Both games use cards, but the rules of each game are different, as are the assigned point values. For instance, the perfect hand in Cribbage is J (knobs)-5-5-5-5, while the perfect hand in poker is A-K-Q-J-10 (all same suit = Royal Flush). The Crazy-8’s game I used to play with my grandpa has a different “perfect hand”. Pitch has yet another. The point is this: If representatives are playing different games within the scope of one brand, wouldn’t it be advantageous to the brand’s retention AND acquisition rates to encourage redistributing the cards face-up based on what the best fit for each CARD is rather than only requiring one game to be played? The greater the variety of games (differentiation between personal brands), the more cards (customers) could be perfectly aligned with each.